What a difference 30 days can make... The RSS was brought down on 1 August, it's been taken apart completely, extensively over-hauled & put back together. So today it was time to get it back on top of the telescope! Gone - almost without a trace! Looking & working better in every way than it did when it came down, the spectrograph was wheeled out into the loading bay outside the spectrometer room. The crafty scheme to pull back a day & thus restore the schedule was to lift the instrument with the detector cold. That required keeping the cryo-cooler attached & running throughout most of the lift & installation. It added a bit more complexity to an already daunting procedure, but it worked a treat as it allowed us to get on sky as soon as all of the cabling/fibres/hoses etc had been reconnected up there. Cryotiger in tow this time! The structure was then rotated into place (by Ant down in the control room) & then with the landing zone within reach, the compressor was disconnected & taken back down to its igloo. Dome crane operator Denville could then tweak the dome rotation & lower the RSS towards the tracker, to be guided down carefully by the many hands below. Timmy & Jono, perched on the edge of the world, could later crank down the chain hoists to slacken the lifting slings. Try not to think about where Timmy was actually standing! 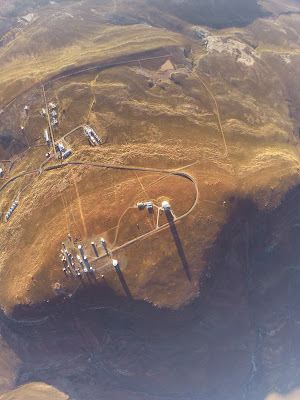 With all the life-support systems connected up top, the control room filled up as Fred did a coarse mirror alignment (a fine alignment was out of the question due to the high the wind). The first pointing was to a spectacular target - M16, also known as the Eagle Nebula, a star-forming region in the constellation Serpens. As usual, a picture was worth at least a thousand words! 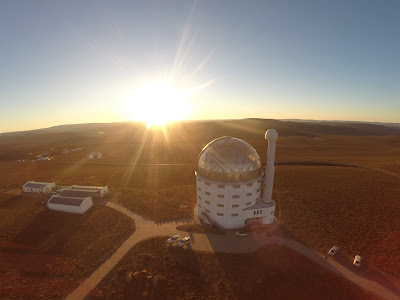 It immediately showed that the telescope pointing's good, the image quality looks fine (given that we could not do a fine alignment of the primary because of the wind), even the guide probe mapping was still close enough to find a guide star. 2 sec SALTICAM image of the Eagle Nebula! It's been an incredibly busy month up here. Huge thanks & congratulations are in order for a superb team effort, & particularly to Ockert for doing a fantastic job of organising & leading such a challenging project! We eag(er)ly await a photometric night to take throughput measurements! Hopefully everything's still on track to lift the RSS tomorrow & (weather-permitting) get back on-sky in the evening! Extreme Observing for the UCT 3rd year astronomy class! This week we've had all the 3rd year UCT astronomy students up here in two batches, learning how to observe & reduce data. 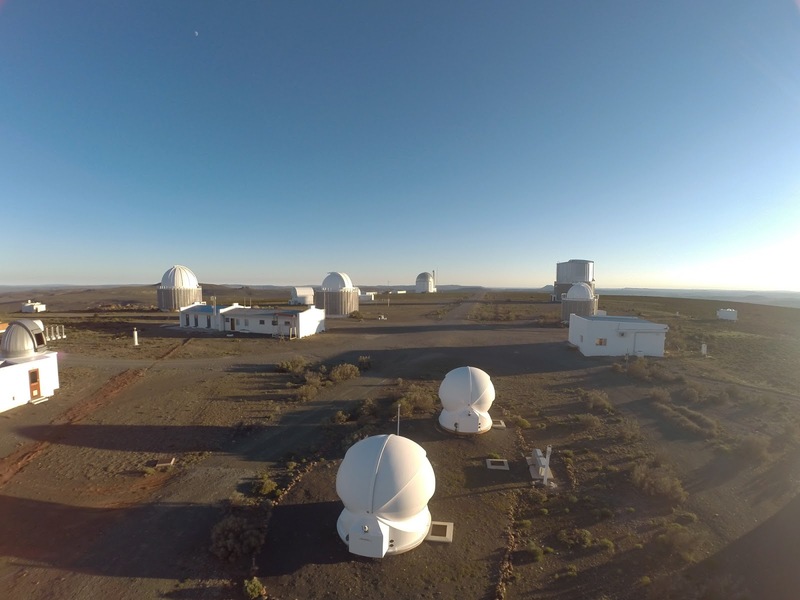 Black belt galaxy hunters Lucas Macri & Renée Kraan-Korteweg have been pushing the 74", SpUpNIC, the students & themselves to their respective limits - obtaining spectra of ~40 galaxies per night during unseasonably good weather the past few nights. The group visited SALT as well & thus got to see the telescope in pieces, with the RSS, SALTICAM & the payload down in the spectrometer room. Good luck guys - hopefully you'll become regulars up here! With the spectrograph back together & most people gone for the weekend, Ant was free to thrash the system from the software side using the new (spare) PCON machine. A huge amount of work was done & most of the acceptance tests were successful. A few issues remain & will be addressed over the coming days, with the hope that the RSS lift will take place on Wednesday. To unwind after all the software testing, Ant produced yet another beautiful hill-top water colour! 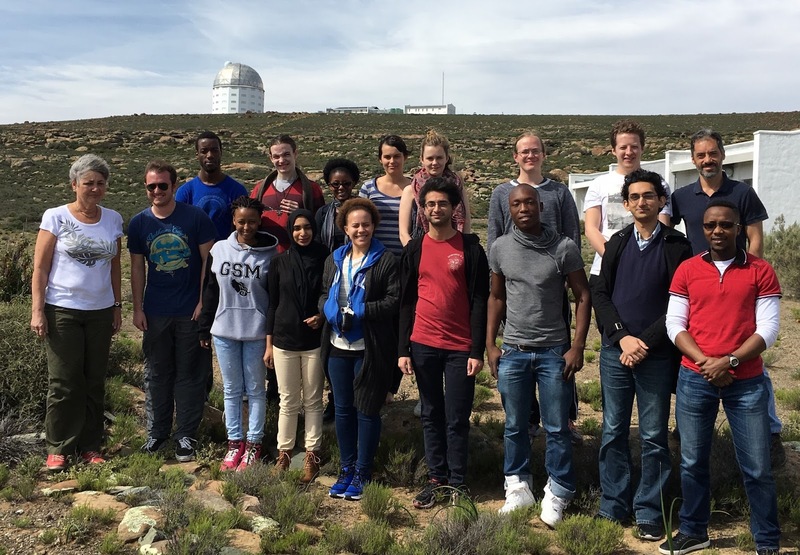 How many future astronomers can you spot in this group? It's been a hugely productive week up here! In just over four days, the RSS has gone from having lens groups & various mechanisms scattered about in different rooms - to being back together, aligned & functional. The hexapod anti-gravity system has also been installed, so that's another major task off the list... Midst all this, Janus still managed to find time to put together this incredible image of the Milky Way arching overhead on a moonless night. This panorama consists of 15 individual 30 second frames (tiled 5 x 3) at ISO 6400 to minimise trailing of the stars. & That is yet another reason why we love this place!! The Milky Way arches overhead on a dark winter night in the Karoo (click to enlarge) - beautiful job Janus! Janus has produced a master(ful) document describing all the many things that need to be checked, mapped & updated once the payload & instruments go back up. 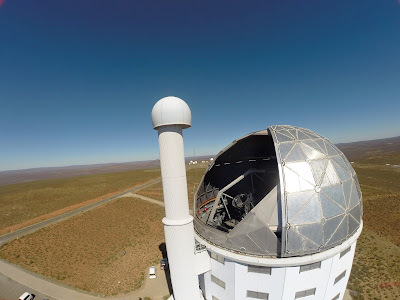 These include the telescope pointing, the auto-collimator offsets, the FIF offsets for the different HRS fibres, all the fiducials based on fold mirror positions, the various guide probes, etc etc. Getting all of that right as soon as we get back on sky is the secret to a happy ending to the shut-down. While better throughput & reliability will be wonderful, enthusiasm is quickly lost if the telescope's not properly functional afterwards! 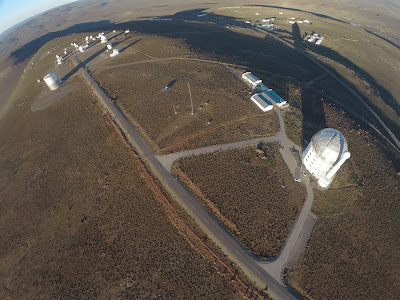 Hugely important too are all the RSS tests that were done before the instrument came down & which will be repeated before it goes back up - Astro Ops is responsible for reducing those data & checking that everything's back where it belongs before the instrument leaves the spectrometer room. While that was happening in the control room, Johan, Nicolaas & Eben were busy up on the tracker installing the new hexapod anti-gravity system - aka the HAGS. This looks a bit like knee-replacement surgery for the tracker, but in fact the new hexapod motors will only be installed early next year. This temporary dislocation of the legs was necessary to allow the springs assemblies associated with the HAGS to be fitted near the apex of each pair of legs. This is the second of the 3 pairs of legs to be done, & the last set does not include the luxury of working from the relatively ergonomic tracker platform. This would be a tough enough job to do if the tracker was on the ground! 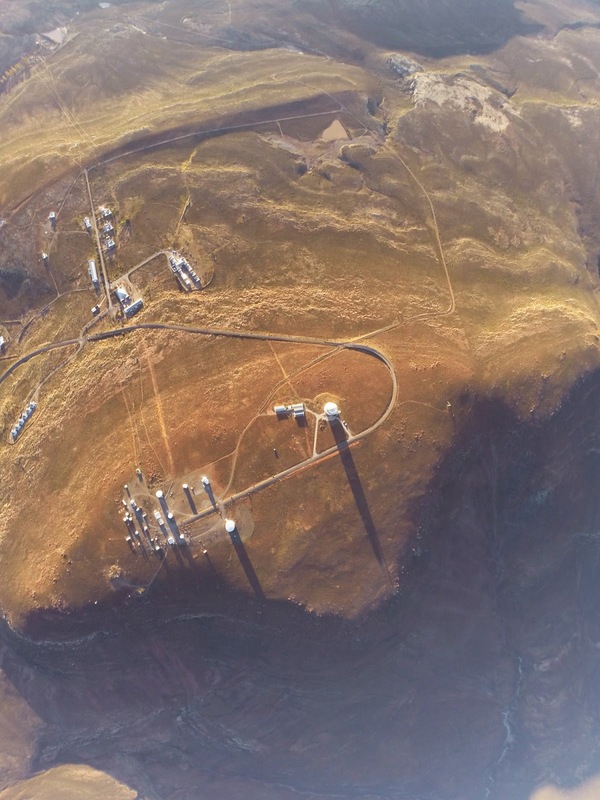 Our Observatory: an aerial perspective! 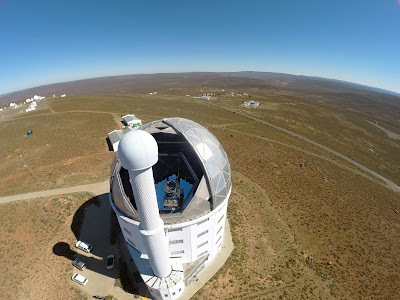 Note the little robotic Birmingham solar telescope on the left that's already hard at work! SALT as you will not often see it! 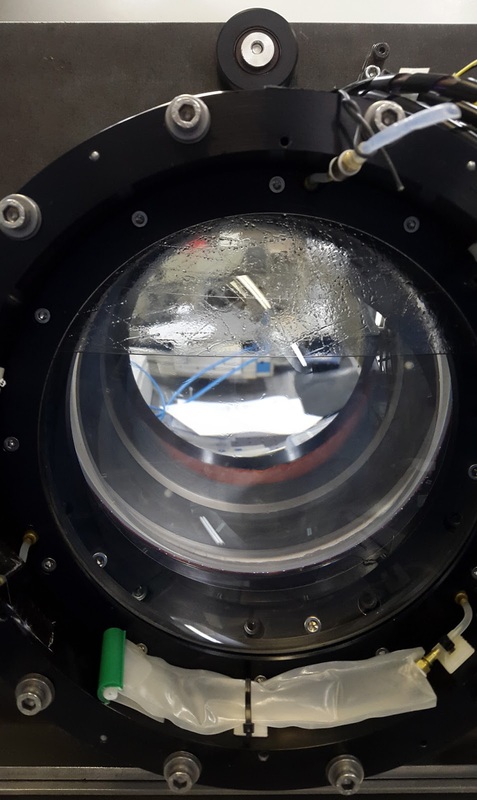 After all the attention received during the optical service, the collimator optics are now also getting some better baffling to protect the lenses & suppress stray light within the instrument. A new gear for the camera articulation was installed & extensively tested. This is a crucial part to allow the entire RSS camera barrel to reliably swing around to the appropriate angle (twice the angle of the grating with respect to the light beam) to suit the grating setup being used. The camera articulation angle can be up to 100 degrees for the spectrograph's highest resolution setting. So yes, that whole section above Eben's head in the pic below can sweep out a huge arc when configuring the instrument for a given wavelength range & resolution. So much for all the daytime action... This week we've also had our Zen Master Telescope Whisperer Fred up here to run SAMS tests with the telescope pointing to CCAS all night (weather permitting). Captain Fred at the helm - sensing edges! Since the telescope is offline, it can happily stare at the CCAS tower from dusk till dawn. That makes this a perfect time to monitor the corrections being applied to the 91 mirror segments by the edge sensors running in closed-loop. This sort of data helps Hitesh to characterise & evaluate the system's performance. Wave-plates & field lens back in! Popped in at SALT late in the afternoon, just in time to catch Jono handing the whole wave-plate mechanism to Keith, who was sitting underneath the RSS. With the wave-plates re-installed, the last of the cleaned & re-filled collimator optics, the field lens group, could go back in as well. Ockert could then check the overall alignment of the optics against the references that were established before the optics were removed. Before all the action starts up again tomorrow, here's a chance to introduce a couple of the other important optics at SALT... Here's a glimpse down the SALTICAM lens barrel. & this beast is the ADC - the atmospheric dispersion compensator that sits just above the SAC, below the payload. It consists of two large wedge shaped prisms, the separation of which can be changed to correct for the different extents to which the atmosphere bends red vs blue light. This is the moving baffle that lives above the ADC & blocks out stray light that's not followed the telescope's optical path. The green reflections are due to the coatings on each of the prism surfaces. 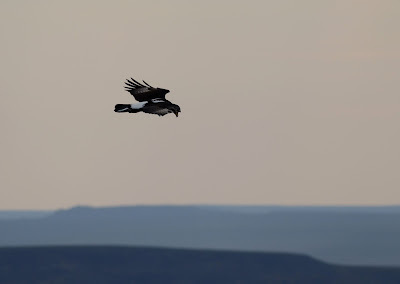 Drove up the hill for a walk this afternoon & spotted one of the eagles sitting on a rock on the SE edge of the plateau. Strolled to within about 200 metres of it before it decided to take off & head home down the cliff to the south. A stunning day up here - hard to believe the weather's due to pack up tomorrow, there's even snow forecast! This morning the guys drained the collimator triplet & replaced the lens fluid in the 2 gaps. Like last time, the scene was quite gruesome! The problematic original lens fluid (which has vastly different specific gravity to the new type of fluid that's been in use since 2011) still refuses to leave the system. Here's the replacement fluid slowly going in... As the gaps fill up, most of the evidence of the old fluid disappears again. The finished product looks Really Fantastic! The throughput measurements were repeated after the fluid change & showed an additional 2-3% increase blueward of 3700 A. Having completed the post-fluid-change measurements, the main group was re-installed in the instrument. The main group & field lens assemblies go into the spectrograph from below. The lens barrel is supported on a wooden frame that's carefully positioned & then slowly jacked up on a lifting platform. With that, it was time to get started on the field lens group. A relatively simple assembly consisting of a fused quartz bottom lens (L1) & a calcium fluoride one above it (L2), with a small fluid-filled gap in between. The dirty assembly was rigged up to the throughput testing system, which consists of a broadband light source, an iris to control the beam size, various combinations of lenses (to re-image the source for each group to be tested), an integrating sphere to even out the light distribution & an extremely handy little spectrograph that Ted donated from his old lab. 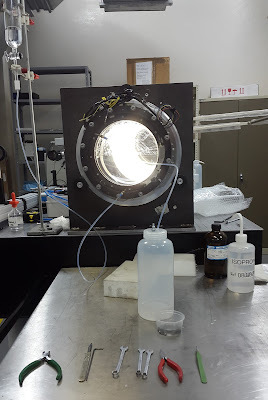 The optic under test is mounted on a pneumatically actuated stage that places the lenses in & out of the beam to produce the differential measurement (a huge upgrade over the old system that relied on a person sitting in the dark actuating the stage!). 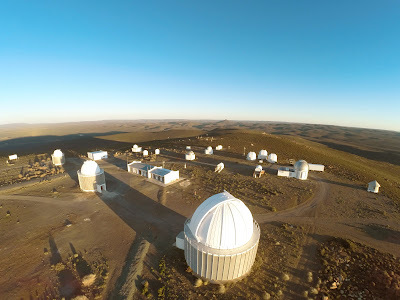 The even more significant improvement is the fact that the throughput measurements over a broad wavelength range are now in the form of spectra obtained at various grating angles, rather than photometric data taken with a set of manually deployed filters. Janus has also written a data pipeline to painlessly calibrate the spectra & display the throughput results - brilliant! Here's the profile view of the field lens group in the beam. While this setting up was going on in the clean room, most of the team was still busy with various tasks in the spectrometer room - only about 11 hours after they showed up here this morning! Tell us a story Uncle Paul! 2.5 weeks into the shut-down, things are still on schedule & going well - great work by all concerned! A new telescope in the family! One RSS lens group done!